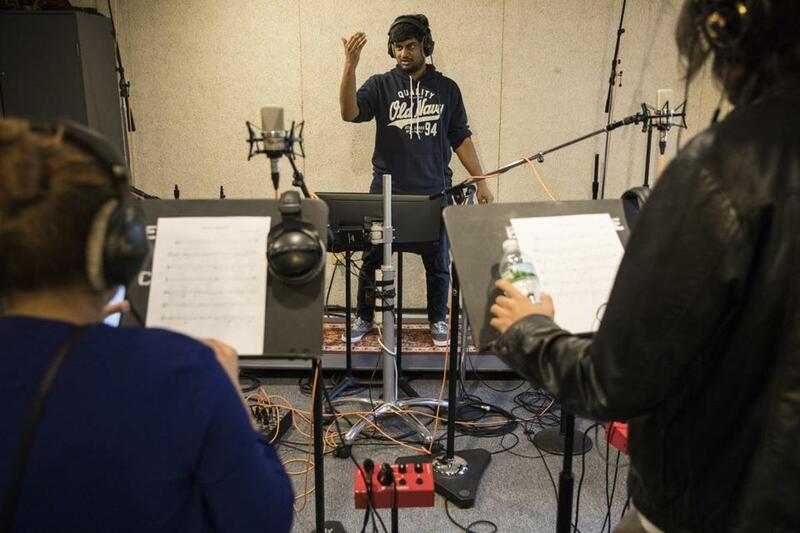 Composer Navneeth Narasimhan conducted singers during a recording session to score the music for a video game at the Berklee College of Music. It’s time for a pop quiz, Duncan Watt decides. Watt is a professor at Berklee College of Music in Boston, and the class he is teaching this morning is called Advanced Scoring and Implementation for Video Games. A few moments ago, Watt had been discussing with his seven students the realities of how composers pitch themselves and quote prices for their work. But suddenly, it’s time to write some battle music. Watt plays an audio clip of music that is martial and pulse-quickening, then asks the students to write four bars of something similar, in the key of F minor. The students turn to their piano keyboards, don headphones, and get to work, summoning snare drums, string sections, and a flotilla of French horns. Games are suddenly omnipresent, on mobile phones, Facebook, console systems, and the Web. The market research firm SuperData Research estimates that worldwide revenue from the business hit $91 billion last year. And accompanying all of those games are soundtracks and sound effects, which require someone to craft them and then tie them to key moments like quests, battles, discoveries, and triumphs. Much of the music — at least for games developed by local video game studios like The Tap Lab, Disruptor Beam, and Turbine — has ties to the Berklee College of Music, which has been teaching courses on video game composition since 2006, and created a minor focused on the industry in 2010. At local video game showcases, the scores for low-budget independent games like “Super Knight Quest” or “Mondrian” (a block-breaking game inspired by the Dutch artist) were written by Berklee students. Alumni have worked on popular game franchises like “Call of Duty” and “Halo”. And faculty members like Watt and Michael Sweet have written music for “Bioshock: Infinite”, “League of Legends”, and “Walden”, a contemplative game in which a player assumes the role of Henry David Thoreau, living deliberately on either a PC or Macintosh. It’s a different art than writing music for film or television, Sweet says, in part because of what he calls “indeterminacy”: you don’t know how long that ascent to the volcano rim is going to take, or when you might get attacked by pterodactyls, so you need to compose a score that doesn’t get dull when it stretches out for a few minutes. It also needs to seamlessly segue from combative to calm — and back again. Often, while still at Berklee, students connect with their peers at other schools who are enrolled in video game development programs, and collaborations get going. At that stage, compensation is usually just in “exposure” or “experience,” says Jade Kim, a Berklee graduate now working as a sound designer at Turbine, a Needham video game studio owned by Warner Bros. (Sound design involves creating the atmospheric sound effects for a game, like coffee cups clinking when you walk into a café, rather than music.) But eventually, full-time jobs can pay $50,000 or $60,000, and top composers may earn $100,000 or more for a project. Richard Ludlow, another Berklee graduate, says it’s a field that is less regimented than film and TV. “There are a lot of set ways of how people think about approaching things in film,” says Ludlow, a cofounder of Hexany Audio in Los Angeles. “Ninety-five percent of the work we do is games, or interactive work for theme parks, or virtual reality, and it’s just fun to be working in a new medium like VR.” One recent project: recording a 38-piece string orchestra in Prague for Moonlight Blade, an online game developed in China by the company Tencent. One issue that looms over the business of making music for games is artificial intelligence. Will software soon get good enough to write that Taiko drum battle music, or a soaring violin passage for a flying scene, at the click of the video game creator’s mouse? “What computers can do really well is copy something that already exists,” Sweet says. “They aren’t as good at breaking the rules and innovating.” In the future, he says, the job of a composer may evolve to include writing rules that will guide artificial intelligence software. Eventually, Gould predicts, music in a game might be customized on the fly so that it is “perfect” for each individual player. But for now, humans still dominate the business of writing music for video games. It’s hotly competitive, but it has a strong pull: “It’s a lot of fun, and that’s why we got into it,” Ludlow says.